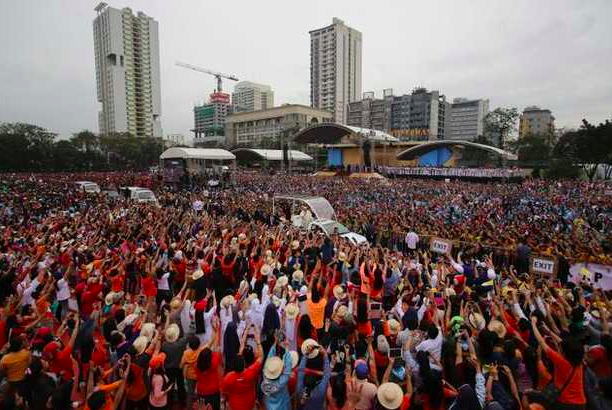 The 76-year-old Argentine pontiff attracted an estimated 6 million people, who braved steady rain on Sunday to catch a glimpse of the leader of the Catholic Church at Manila’s Rizal Park, on his final full day in the island nation. The turnout breaks the record set by the last pontiff to say mass in the same venue – Pope John Paul II in 1995, when five people million attended, according to the Vatican. “We need to care for our young people, not allowing them to be robbed of hope and condemned to a life on the streets,” he said. The Mass took place on the third and final day of the pope’s visit to the Philippines, whose roughly 80 million Catholics comprise about 7% of the world’s total. The pontiff arrived Sunday on a popemobile based on the design of a jeepney, the modified U.S. Army World War II jeep that is a common means of public transport in the Philippines, wearing the same plastic yellow rain poncho handed out to the masses during his visit to the central Philippine city of Tacloban a day earlier. The pontiff was forced to cut his trip short to Tacloban — hard-hit by Typhoon Haiyan in 2013 — ahead of the approaching Tropical Storm Mekkhala. About 150,000 people, including survivors of the typhoon and of the earthquake on the island of Bohol that killed more than 200 people in October 2013, braved the approaching storm to attend Mass with the pope. The pope’s tour, which also took him to Sri Lanka, was his second trip to Asia in five months, in a nod to the region’s growing importance for the Catholic Church as it faces declining support in Europe and the United States. It was also the fourth papal visit to the Philippines, and the rapturous reception given to him throughout his stay cemented the nation’s status as the Church’s Asian role model.